In an ambitious ‘Internet of Energy’ juggling act, a Texas test center plans to demonstrate how to manage 100 distributed energy resources on a microgrid. Group NIRE will host the project at its Reese Technology Center in Lubbock, Texas, along with partners DNV GL and Geli. The project is being funded through a $2.15 million federal grant and $600,000 in private funds. The group intends to demonstrate one of the biggest promises of the Internet of Energy: the ability of distributed energy resources to serve many masters; the intended customer, the local utility and the larger grid. 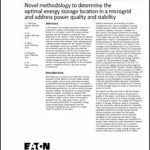 “We want to test out the concept of collections of behind-the-meter resources providing services to both the local utility and to the market simultaneously,” said Michael Kleinberg, a DNV GL senior consultant and primary investigator for the project. To that end, the project will bring together solar, energy storage, LED, electric vehicles, HVAC controls, household appliances and a range of other distributed energy resources under one grid-connected microgrid operated by Group Nire. “In a limited fashion we have been dancing around this subject for some time, looking at specific applications and specific pieces of technology,” he said. But this time the testing will be broader, not only in terms of ‘things’ tried, but concepts explored. The project will focus on the importance of location in planning distributed energy resources. And it will probe how to handle conflicting grid needs – an issue being debated in New York under its Reforming the Energy Vision (REV). Kleinberg said that it is becoming increasingly clear in REV that the future is not just about what distributed resources you provide, but where you provide them. For example, what happens when a local utility faces system overload at a particular location, but the central grid is experiencing the opposite condition. If the EV chooses to charge at that time, the local utility suffers but the larger market benefits. Whose signal should the EV respond to? The project will consider incentives needed for the complex system to work and provide value. The goal is to make distributed energy resources more bankable, and therefore easier to finance. The group is now seeking product manufacturers who would like to contribute their distributed energy resources for testing. Devices will be used individually and in aggregate over a three-year period. While vast in devices, the project is relatively small in terms of energy production, with the devices together producing no more than 1 MW. However, the project also intends to tie into larger generators that already exist at Lubbock site. The team intends to phase the 100 distributed energy resources in over time. It will begin developing the controls in the first two quarters of 2016 and will test signal devices later this year. Over the next two years the project will roll out the devices in increments. DNV GL is acting as project lead and also will handle modeling and independent verification. Group NIRE and Geil will produce and operate an Internet of Energy platform to integrate the management of the distributed energy resources. Project funding will come from the Advanced Research Projects Agency-Energy (ARPA-E), as part of the DOE’s Network Optimized Distributed Energy Systems (NODES) program, which was announced in December. The project will be integrated with local utility monitoring, control and data acquisition systems to demonstrate management of the distributed energy resources using Geli’s Internet of Energy software. The platform manages both market level regulation and distribution system support functions. The goal is to facilitate large-scale integration of renewable generation onto the grid. The platform will attempt a novel and scalable approach for the fast registration and automated dispatch of distributed energy by combining DNV GL’s power system simulation tools and independent third-party validation with Geli’s networking, control, and market balancing software, according to the group. Track news on microgrids and distributed energy resources by subscribing to the Microgrid Knowledge newsletter. It’s free.